Each Roofing Shingle covers about 3 square feet of roof area and replaces and be used where asphalt shingles are appropriate. These solar roofing shingle panels are New Original Stock. Manufactured during 2007 and have been in storage since. The PV shingle face is textured to blend and complement the granular surface of conventional surrounding shingles. Each shingle is 12 inches (30.48 cm) wide by 86.5 inches (219.71 cm) long and nailed in place on roof decking over 30 lb. felt sheeting. Electrical lead wires, #18AWG, extend 12 inches (30.48 cm) from underside of each shingle and pass through the roof deck allowing interior roof space connections. Once in place, the suns warmth helps bond shingles together forming a weather-resistant seal. Cell exposure 5.0 inches (12.7 cm) x 86.4 inches (219.46 cm). Array size depends on power demands. UNI-SOLAR Photovoltaic shingles serve as a conventional shingle for weather protection, while generating clean solar electricity to commercial and residential buildings. 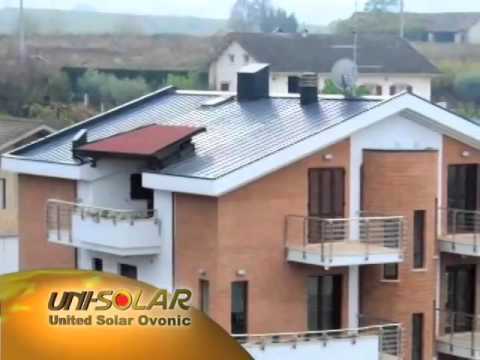 Unisolar solar roofing shingles. These shingles have been honored with the prestigious Popular Science Grand Award, “Best of What’s New (Environmental Technology),” and Discover magazine’s “Technical Innovation Award” for best innovation. Uni-Solar has since gone out of business and the panels no longer have manufacturer support, however, we have sold over a million watts of these panels with no defective panels. The manufacturing process was so refined that all defects were caught before the panels were completed and packaged. These are also being sold by-the-panel as individual units. Contact us for details. Uni-Solar panels are lightweight, flexible and directly adhere to many roofing surfaces avoiding penetrations. Each cell is connected to each other via bypass diodes. Therefore, if one cell is shaded or soiled, only the power output of this one shaded cell is lost – usually less than 4.5%.These roofing shingles are less than 1/5th the weight of crystalline solar panels and are designed to replace the need for asphalt shingles. Here is a video with many examples of the various types of panels Unisolar Made.